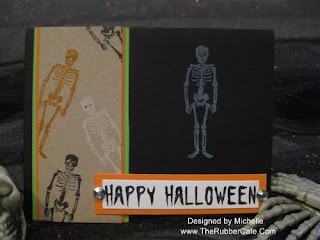 The Rubber Cafe Design Team Blog: Frightfully Fun Friday! Booo! Scare ya?! Well, okay these cute skeletons aren't really scarey! They are really cute though and fun to work with! I guess you can tell they're a favorite as well! When The Rubber Cafe came out with this one it hit me just right! 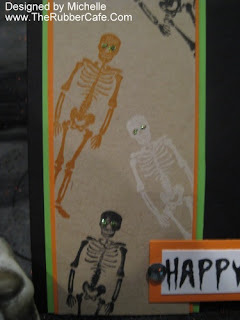 It's called "You Shake My Bones" He's paired up with a couple other great Halloween stamps that are out for this years "Trick or Treat" season! The first one is called "You Need to Dust" This cobweb is actually a great stamp with SO many possibilities! You can do white ink on a dark background, like I did or stamp it in black ink for a light background and, just think if you were to emboss it! How cool would that be?! The other stamp is a great, timeless stamp called "Classic Halloween"! This type of stamp can be used over and over for years to come! I love non-trendy stamps like this, don't you?! 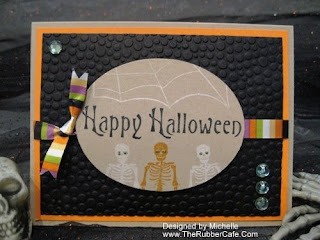 There's a ton more great Halloween stamps over at The Rubber Cafe so why don't you check it out! I'd love to see what you create with yours! When you finish your projects how about leaving a message with a link?! We'd would love to see your creations too!